Last year during the Tour de Fleece Batt, I enjoyed taking artful pictures and writing descriptions of each day’s fiber. It was a lot of work though, for not much payoff. I’ve been lamenting the fact that I can’t afford to put that much time into each and every batt I make. However, it occurred to me that if I were to make the batts in larger batches it might make sense to be able to feature each set more in depth on my blog with descriptions and pictures of the process from start to finish. Without further ado, the first batt batch is featured below: Taste the Rambo Rainbow. You may remember the following pictures from my adventures in solar dyeing, courtesy of a tutorial by Jazzturtle. 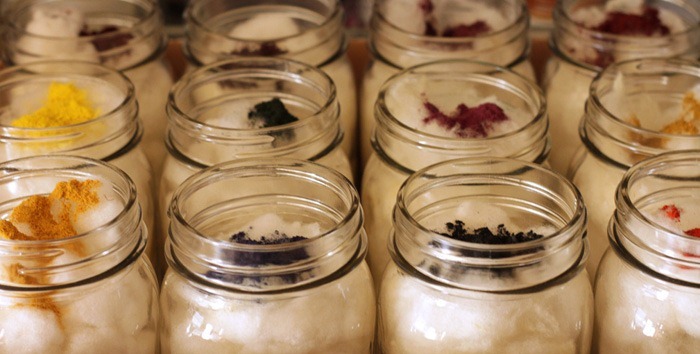 A couple of ounces of wool went into each jar, topped with dye powder and boiling water, then a few hours out in the sun to bake. Here is the resulting brightly colored Rambouillet wool on the drying rack. This wool has a very interesting texture. Unlike Mohair or Romney, there are no easily visible, individual hairs. The fibers all blob together like a sponge with rubbery elasticity. This batch has some natural lanolin left in the wool, which will soften your hands as you spin but can easily be removed from the finished yarn with a soak in hot water. The fiber was run through the carder only once—just enough to hold it together but not enough to truly blend. The large chunks allow for easy separation of colors if the spinner desires a more controlled color stripe pattern. Spun as-is, the results will be a lumpy-bumpy mix of color and texture. There are 12 ounces of this fiber available in my shop (broken into six 2-ounce batts), which is plenty in case someone who wants enough fiber for a larger project. Of course, I had to save a little for myself. I haven’t decided yet what to make with it, but I’m sure it will be epic. This is the first time in YEARS that I made batts without glitz in them… and I’m really fighting the urge to add some sparkle to mine. Yeah, that’s it. I can’t stand it anymore. I have to go card in some angelina and spin it right this second.